Woodruff Place has 74 historic 5-globe light fixtures which were first installed more than 100 years ago. The Town of Woodruff Place owned the fixtures until annexation in 1962 when the City took ownership. 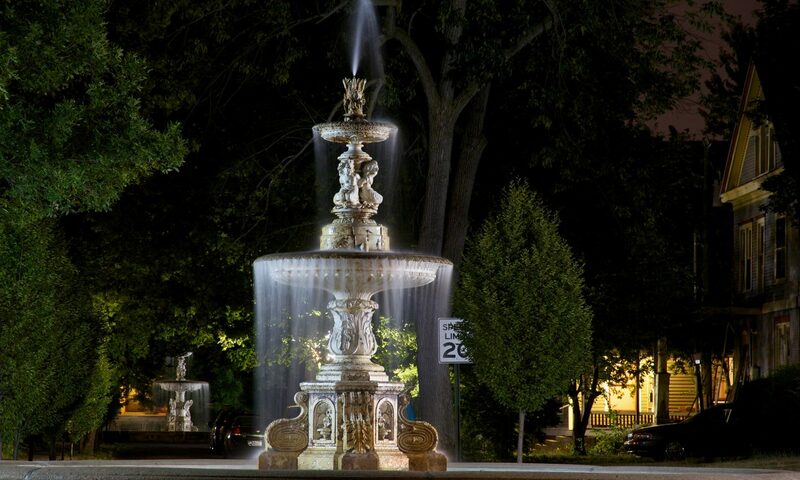 In 2012, these historic fixtures were retrofitted with LED lighting technology thanks to a federal grant managed by the City. In exchange for the retrofit, Woodruff Place agreed to maintain them, and a group of volunteers – the Light Brigade – has overhauled 25 fixtures to date. Nine more are scheduled for overhaul in 2017. A massive concrete fence graces the northern boundary of Woodruff Place and is endearingly referred to as the Tenth Street fence. Suffering the ravages of time, weather and the automobile, sections of the fence had to be removed over time. In the late 1980s, the Woodruff Place Civic League began the long and tedious task of restoring the fence, piece by piece, section by section. The work continues today. The six original entrance curbs were restored around 1990 and the large, ornate posts were reproduced on site. The hospitality committee (4-5 members) is responsible for planning and implementing the food and other supplies needed for certain events in Woodruff Place. These events have included, but are not limited to: Civic League general membership meeting and dinner twice per year, Homes Tour “thank you” dinner for volunteers and hosts, Preserving the Future “thank you” reception for donors. The hospitality committee typically does not cover events such as Casino Night, Easter Egg Hunt, Halloween Party, but planners of other events can request help from the committee if needed.